I’m afraid Speaker Paul Ryan’s poverty forum will fall short of coming up with solutions that will truly help lift the poor out of poverty. Real solutions should expand policies that have already been proven to work: strengthening the social safety net, making poverty programs better coordinated and more accessible to low income families, and improving job opportunities and wages across the board. Given his past comments, it seems hugely unlikely that Ryan’s effort will emphasize these priorities, and will instead focus on pure distractions, like alleged fundamental design flaws in safety net programs that keep them from working. For example, Ryan’s arguments that the safety net creates disincentives to work can be solved by increasing program funding to flatten out phase out ranges to ensure minimal market distortions—that is (again) making the programs more generous. While some programs (e.g., the Earned Income Tax Credit [EITC]) already have these gradual phase-out ranges, others could be improved. The health insurance marketplace created a smooth transition from Medicaid to the marketplace with exchange premium and cost-sharing subsidies. Unfortunately, many states failed to expand Medicaid, leaving its near poor in the unnecessary gap. Child care subsidies, while vitally important and woefully underfunded, could be enhanced so that recipients do not fall off that eligibility cliff (PDF). Ryan wants people to think that these issues represent a fundamental problem with these programs that can only be solved by ripping them up root and branch and sending core responsibility for safety net programs to the states. But this is wrong—these problems can best be solved with more money for benefit expansions and program coordination, including more generous and gradual phase out ranges. The fact is that Ryan’s main proposal to merge safety net programs and block grant funds to states are likely to do more harm than good, leading to increases in poverty, not reductions. The American safety net does, of course, have a fundamental flaw: it’s simply not generous enough, because we do not provide it enough money. Any serious agenda to address poverty should attack both pre-tax and transfer inequality (mostly by boosting hourly compensation for low and moderate-wage workers) and post-tax and transfer inequality by strengthening the safety net. Because of the dizzying rise in inequality that has stunted growth for low- and moderate-income families’ living standards in recent years, improvements to the American safety net are the only reason we have made any meaningful progress at all in pushing down American poverty rates. In fact, all progress achieved in reducing poverty over the last three-and-a-half decades has been wholly due to an improved social safety net (PDF). This can best be seen when looking at a comprehensive measure of income and poverty that incorporates not only market-based incomes (such as wage income) but also cash transfers (through Temporary Assistance for Needy Families [TANF], Social Security, unemployment benefits, etc. ), government in-kind support (such as SNAP benefits, health care benefits, and housing subsidies), and tax benefits (e.g., the EITC). 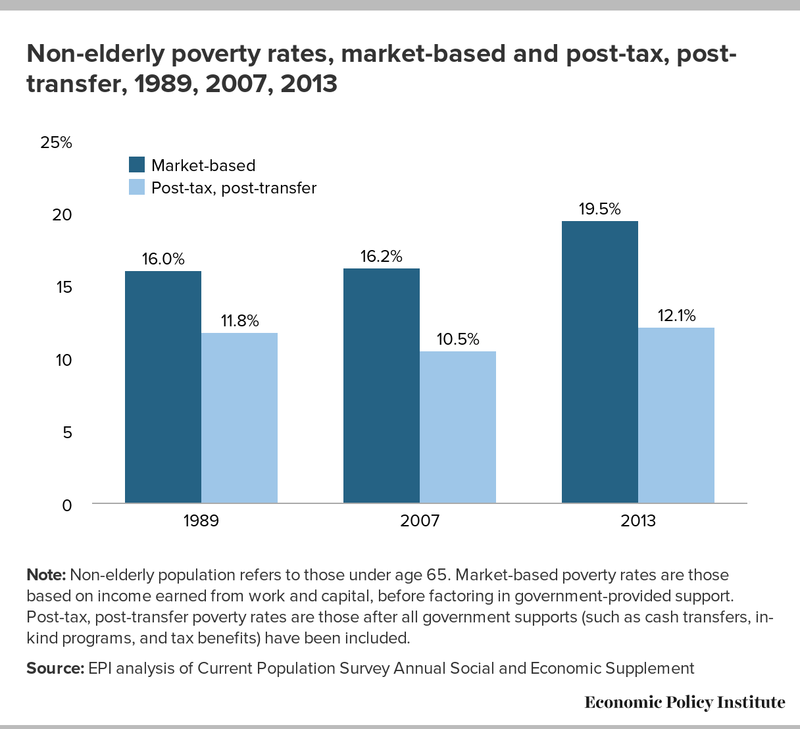 The figure below displays both market-based poverty rates (poverty rates based on income earned from work and capital, before factoring in government-provided support) and post-tax, post-transfer poverty rates (poverty rates once all government supports such as cash transfers, in-kind programs, and tax benefits have been included) for the non-elderly population (those under age 65). In 1989, market outcomes yielded a non-elderly poverty rate of 16.0 percent, but actual poverty, when counting tax-and-transfer programs, was lower (11.8 percent), indicating the social safety net reduced poverty by 4.2 percentage points. About 20 years later, in 2007, the market produced slightly higher poverty (16.2 percent) among the non-elderly population (despite large increases in economy-wide productivity). In that year, the safety net lowered the non-elderly poverty rate even further (by 5.7 percentage points), bringing it to 10.5 percent. These data indicate that the entire improvement (or, more than the entire improvement) in reducing observed non-elderly poverty from 11.8 percent in 1989 to 10.5 percent in 2007 was due to the safety net. This is true over 1967–2007 as well (PDF). 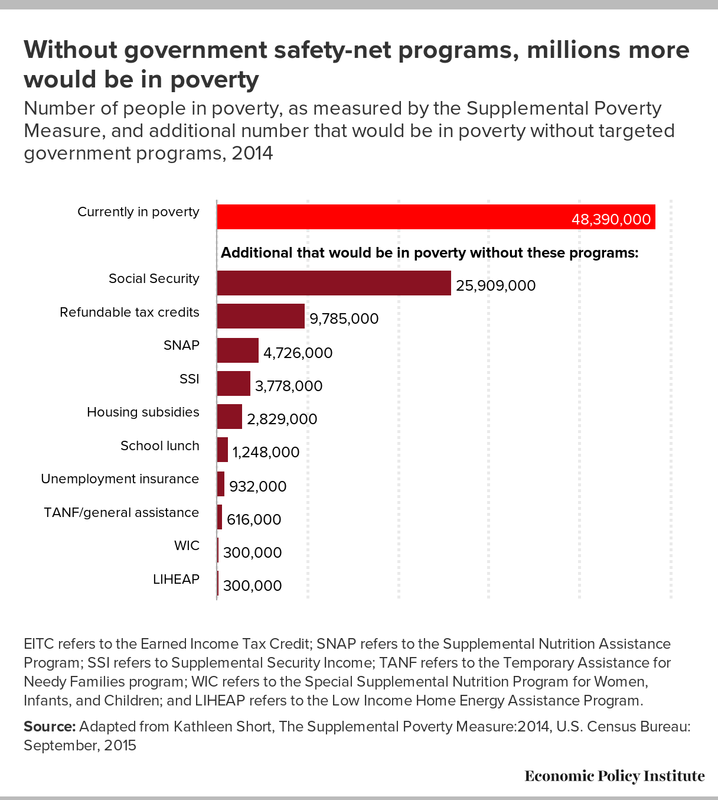 Let’s take a closer look at these safety net programs and their power in reducing poverty. The figure below shows how leading anti-poverty programs have reduced how many millions of people in poverty. In 2014, 48.4 million people (or 15.3 percent of the US population) were in poverty, as measured by the Supplemental Poverty Measure (SPM)—a more sophisticated approach for measuring economic well-being than the official federal poverty line. As the figure shows, that number would have been significantly higher were it not for the social safety net. Social Security was by far the most powerful anti-poverty program last year, keeping 25.9 million people out of poverty. Refundable tax credits, such as the EITC and the Child Tax Credit, kept 9.8 million people out of poverty. The Supplemental Nutrition Assistance Program (SNAP), aka food stamps, kept 4.7 million people out of poverty, while other targeted programs (such as housing subsidies, unemployment insurance, and school lunch programs) made it possible for millions more to keep their heads above water. Overall, the safety net has produced significant progress toward reducing poverty and significant work can be done to strengthen it, but the tax-and-transfer system needs to be complemented by a better labor market for low-wage workers. Without hourly wage gains and sufficient hours of work for the bottom fifth of households, the tax-and-transfer system needs to work harder simply to keep poverty rates from increasing. If we were to see broad-based wage growth consistent with increases in productivity and on par with a full-employment economy, the resulting impact on poverty reduction would be more than half as large as that of our entire range of current anti-poverty programs. 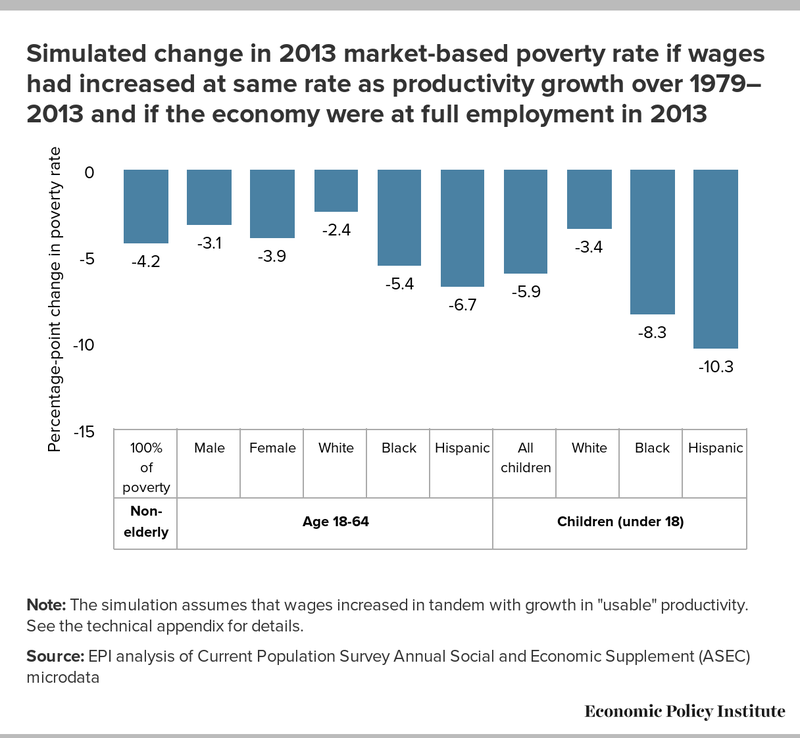 The figure below shows how much lower the market-based poverty rate would be if we modeled such a scenario. Here, we see that wage growth consistent with productivity growth and a full employment economy would mean that the non-elderly poverty rate would be 4.2 percentage points lower. These results are astounding for particular demographic groups: while the effect of raising wages would lead to reductions in poverty across the board, it is particularly significant for children of color. The policy agenda to combat poverty through wage growth includes the same solutions that raise wages for all workers. To reverse the trends of elevated poverty, stagnating wages, and increasing inequality, we must strive for a full-employment economy through public investment and worker-based Federal Reserve decisions. We must also make policy choices that give greater power and protections to workers, such as raising the minimum wage, increasing the overtime threshold, and eliminating wage theft. Finally, we must strengthen, not weaken, the social safety net to ensure that all Americans retain a minimal standard of living.